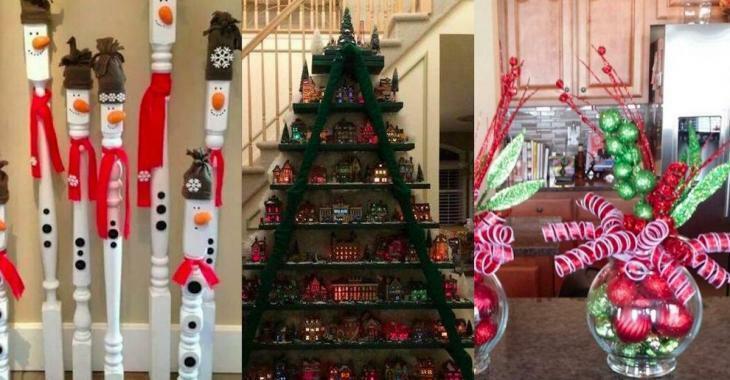 Decoration : 12 brilliant Christmas decorations ideas! This Christmas, we put aside the ornaments bought in stores and we make our original decorations! This Christmas, we put aside the Christmas ornaments bought in stores and we make our original decorations! For the holidays this year, give up inflatable snowmen and other expensive products from the stores. Let's create a magical and festive atmosphere, by recycling everyday objects or go buy stuff to your favorite craft shop! And to inspire you, here are 12 interesting and original ideas! Let's go now! Make your own Christmas ornaments! Wood is a noble and ecological material, which brings a rustic and warm touch to every decorations. These snowmen are more resistant and sustainable than any plastic decoration! Collect some of PVC pipes from your last work and make a giant candy cane with some white paint and some red ribbons! You can put it outside or inside the house. You can even add Christmas lights for an even more magical effect! Take a simple light garland and add foliage, bells, ribbons or bows and there you go! Wonderful! You can hang it on a handrail, or make a table runner! What a festive lighting! Let your creativity run wild! Keep your corks and make a nice festive wreath ! Instead of throwing away your old chair legs, here's what you can do ! Find glass or plastic jars of spherical shapes and decorate them with little shiny Christmas balls and colorful ribbons! Go to your workshop to make this beautiful decoration! It's easy, super creative and really cute! A ladder, natural or artificial branches of Christmas tree, houses and characters, and voila! Stack 3 fish bowls, vases, ... Add the decorations of your choice! We wish you a very, very happy holiday season, in the company of those you love more than anything, surrounded by your beautiful decorations made with love!